There's nothing like playing army with the neighborhood kids when you're little. Anything from piles of snow in the winter or the patio furniture in the summer can turn into battlements. Their best friends get to play zombies and your little one is, of course, the hero. They used to make the shape of a pistol with their fingers and say "pew-pew-pew," which may have been a laser gun, we're not sure. But one thing that's for sure is that a little upgrade to playtime is never a bad thing! It didn't matter that one ever won those backyard "wars." The only thing that mattered was spending time with friends outside, using imagination and creativity to create a world that we can never quite experience again as adults. Making memories! 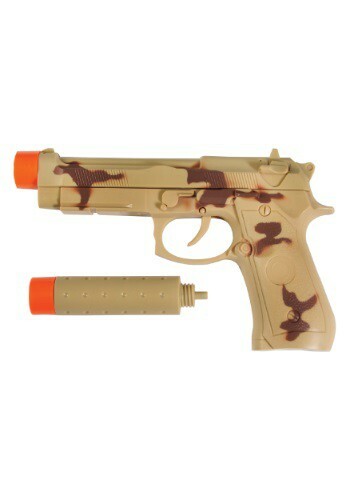 This realistic but very FAKE toy pistol has a great camo print on both sides. While it may look quite realistic, there is a bright orange tip on the barrel so it's identifiable as a toy. It's equipped with realistic sounds and even has a silencer barrel that can attach and detach for those important stealth missions. If your little one loves to play with their friends out in the backyard, or indoors, or maybe they're just going as a soldier for Halloween this fake pistol is going to let them holster their finger gun forever.